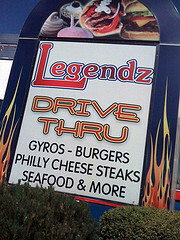 There are two fast food places in Tacoma that I would travel to if I really had a craving for a burger and one of them is Legendz at 1201 South Sprague. It is exclusively a drive through with no indoor seating, though there are a couple of tables on the side of the building. For fast food, it is slow. That’s because they are actually waiting until one orders to make it. The burgers are really big and very tasty and thankfully they don’t publish the calorie count! Dear daughter had the fish burger and said it was also really good. 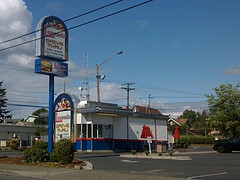 This entry was posted in Restaurants, Tacoma, Take Out, WA State - Pierce County and tagged burger, drive through, hamburger, Legendz, Sprague, Tacoma, WA on June 23, 2011 by admin.